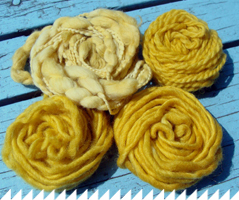 The main goal of the Textile Arts Center is to provide support to fiber artists, and everyday people interested in working with fiber, by acting as a resource facility and creative meeting place. The Center is situated on Carroll Street, between Brooklyn’s leafy Park Slope and the gallery-rich Gowanus neighborhoods. It occupies a newly renovated, 3,200sf space in an old sweater factory. Two giant arched windows designate the street-level gallery and workspace. With its curved felt-covered walls, custom-designed light grid, and plenty of worktables, the Center is designed to serve the established and emerging creative community of Brooklyn. It features state-of-the-art weaving, screen-printing and dyeing equipment, including 30 multi-harness floor looms, a large vacuum-sealed exposure unit and two fabric-yardage screen-printing tables, plus much more. 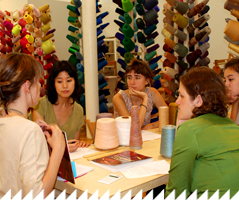 As a show of commitment to the fiber arts community, the Textile Arts Center will soon be offering residency positions to outstanding artists in the field, as well as affordable private workspaces with late night access to our studios. What type of looms are used at the center? We use mostly floor looms, but table looms as well. We have 2,4, and 8 harness looms from a variety of vendors — Schact, Harrisville, Ashford, Saori. Hope this answers your question! Please let me know if you have any other questions or concerns. I would like to sign up for the knitters class. What are the times and days? Thanks. I will see if we can come up with other option for a specific vintage bark cloth, but first thing that comes to mind is source4style.com… Have you visited this website? Hope you can come visit us soon!